What the hell is it with the Internet and rubber chickens? 2016 seemed to be the year the rubber chicken arrived, via a string of viral videos, and it seems YouTubers aren’t done with them just yet. The latest, umm, application of the squeaking dog toy comes from our new favourite YouTube channel Garage 54. Recently we saw the Russian-run outfit attempt to run a car on wooden pistons and replace a wheel with Coke bottles, but neither of those videos can possibly compete with the hilarity of this one. 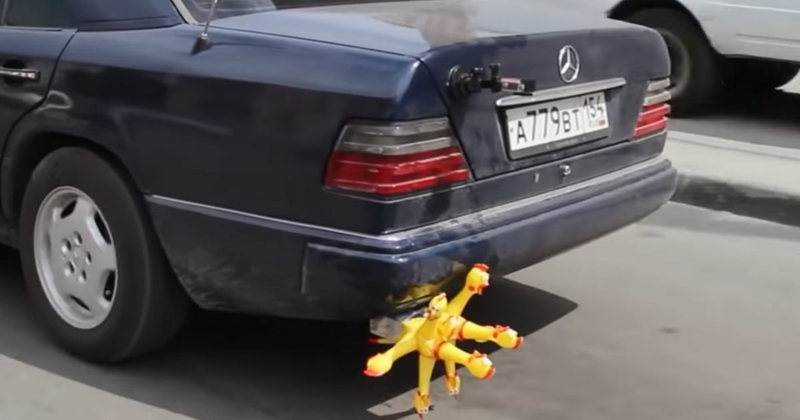 Not only do we get to see multiple rubber chickens (with a few modifications, of course) strapped to an exhaust pipe; we also have the bonus of seeing a bunch strapped to a tyre. Although this does result in multiple decapitations. We can almost guarantee you’ll laugh at this.